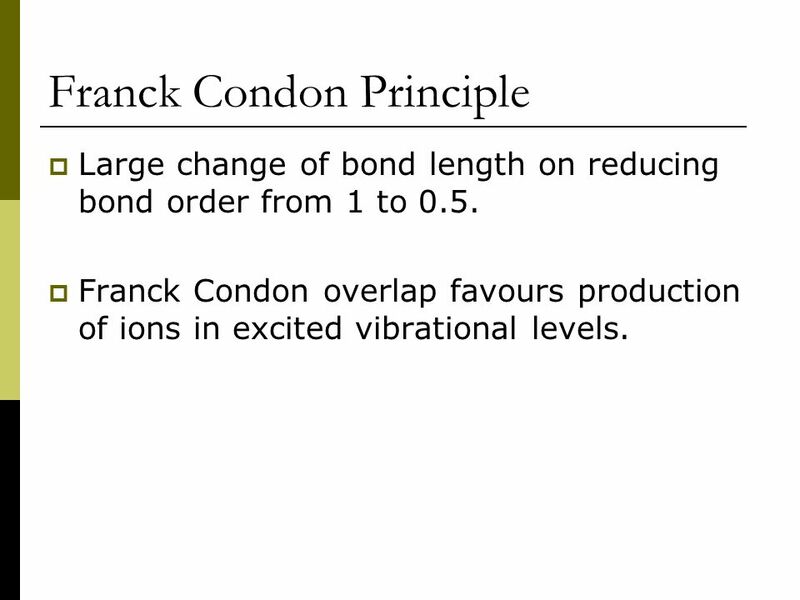 Large change of bond length on reducing bond order from 1 to 0.5. 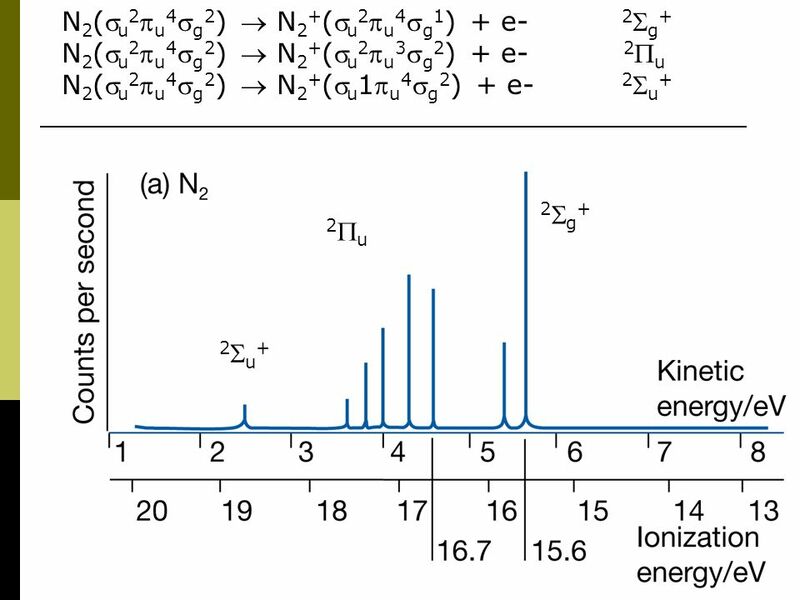 Franck Condon overlap favours production of ions in excited vibrational levels. 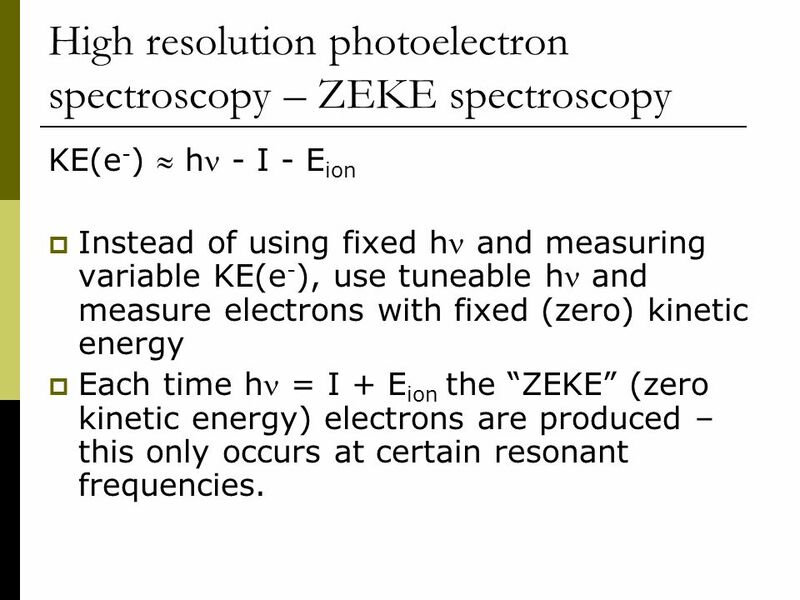 KE(e-)  h - I - Eion Instead of using fixed h and measuring variable KE(e-), use tuneable h and measure electrons with fixed (zero) kinetic energy Each time h = I + Eion the “ZEKE” (zero kinetic energy) electrons are produced – this only occurs at certain resonant frequencies. 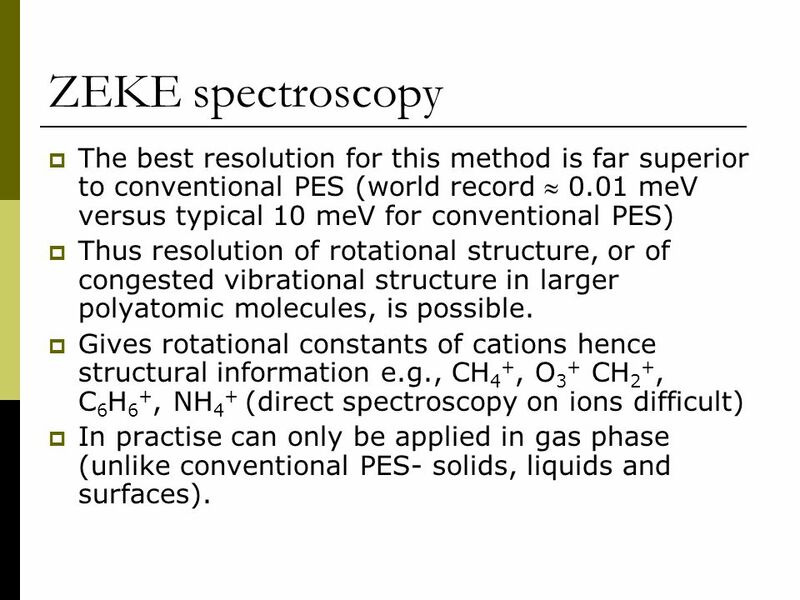 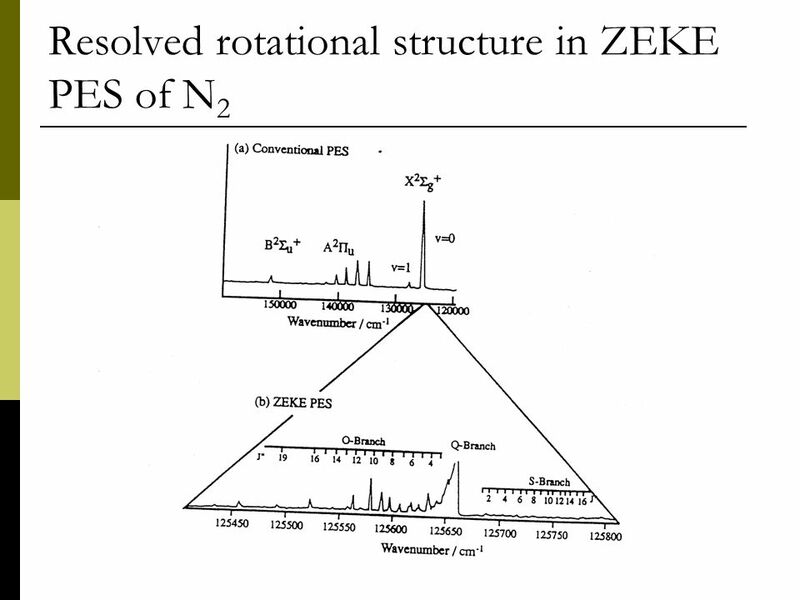 26 ZEKE spectroscopy The best resolution for this method is far superior to conventional PES (world record  0.01 meV versus typical 10 meV for conventional PES) Thus resolution of rotational structure, or of congested vibrational structure in larger polyatomic molecules, is possible. 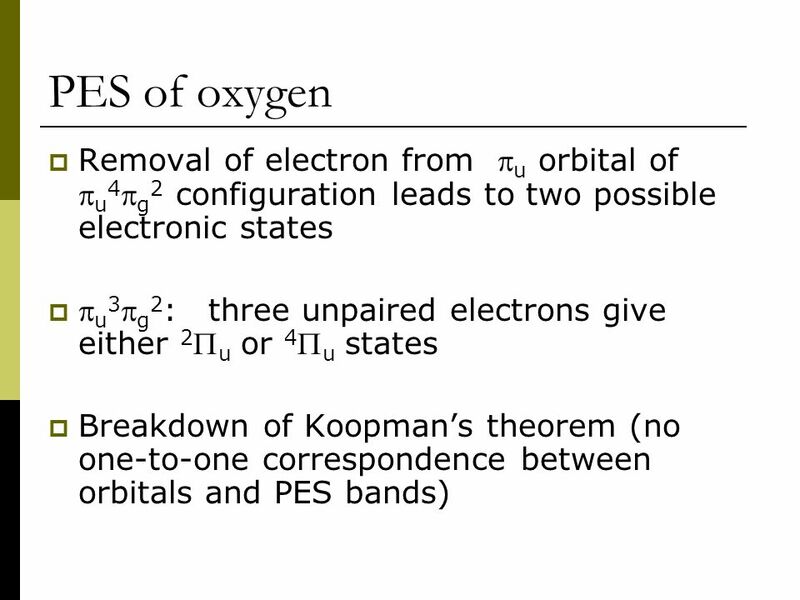 Gives rotational constants of cations hence structural information e.g., CH4+, O3+ CH2+, C6H6+, NH4+ (direct spectroscopy on ions difficult) In practise can only be applied in gas phase (unlike conventional PES- solids, liquids and surfaces). 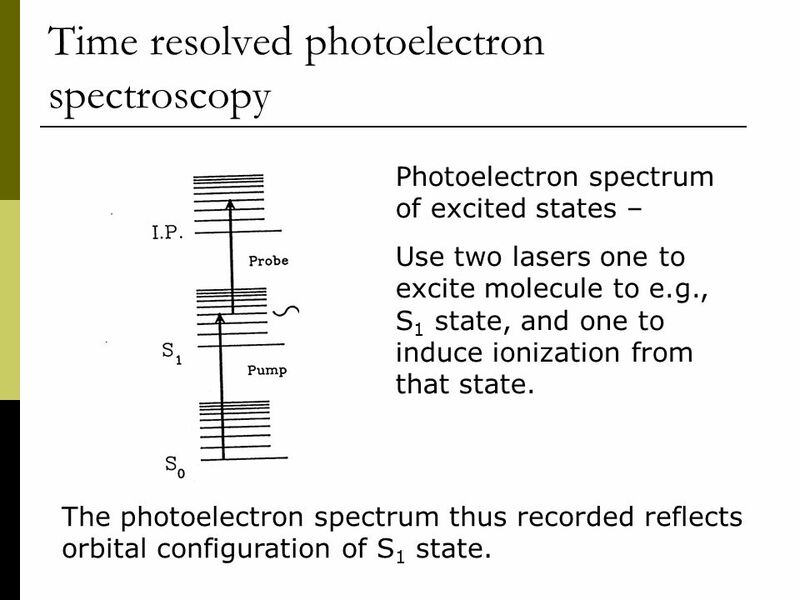 Photoelectron spectrum of excited states – Use two lasers one to excite molecule to e.g., S1 state, and one to induce ionization from that state. 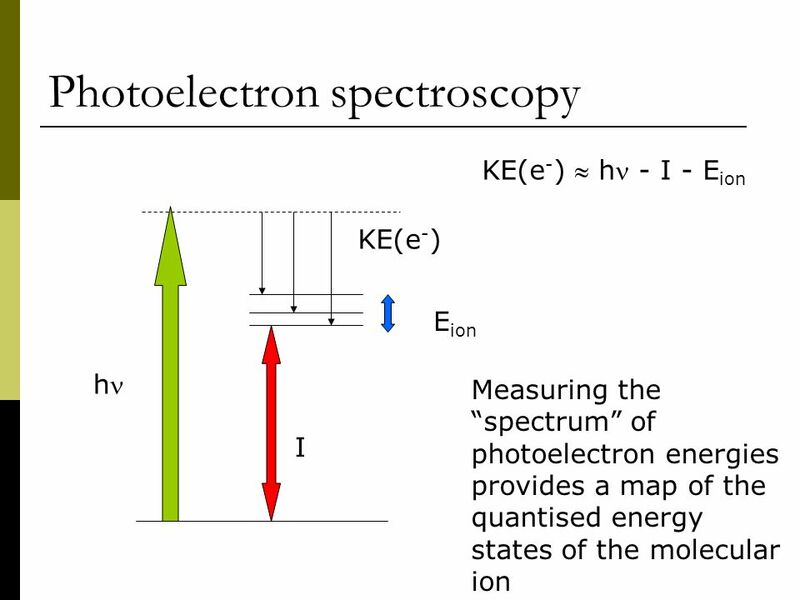 The photoelectron spectrum thus recorded reflects orbital configuration of S1 state. 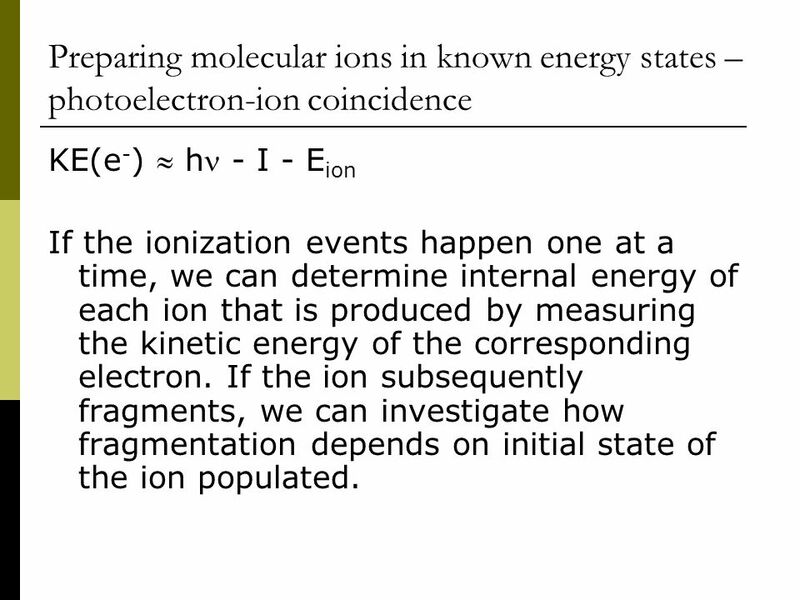 KE(e-)  h - I - Eion If the ionization events happen one at a time, we can determine internal energy of each ion that is produced by measuring the kinetic energy of the corresponding electron. 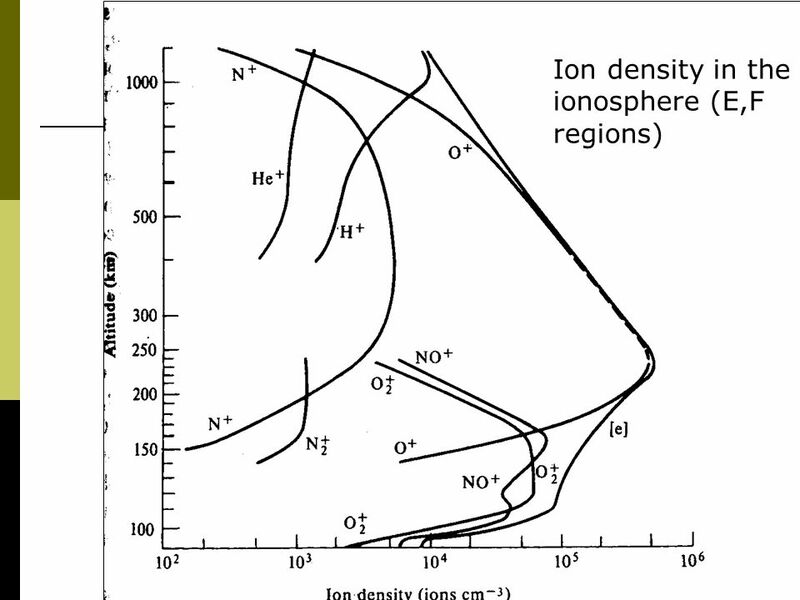 If the ion subsequently fragments, we can investigate how fragmentation depends on initial state of the ion populated. 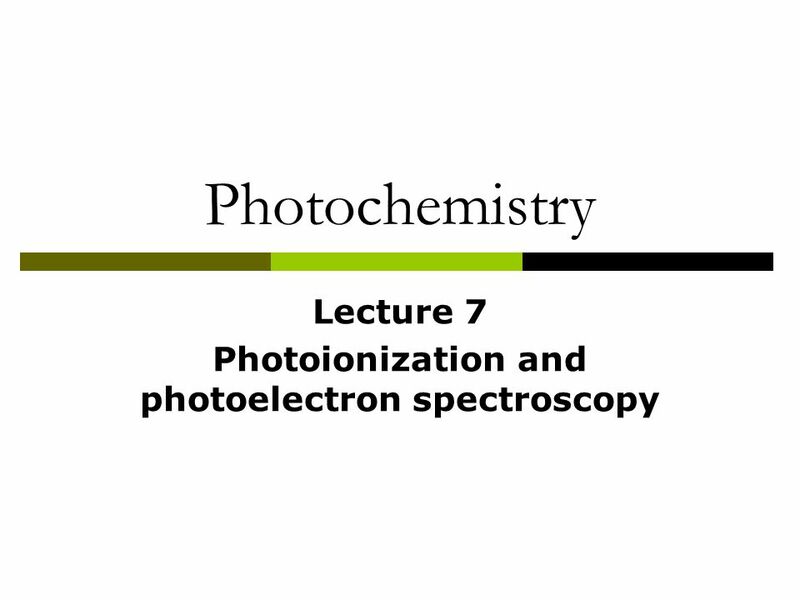 Download ppt "Lecture 7 Photoionization and photoelectron spectroscopy"
Photochemistry Lecture 8 Photodissociation. 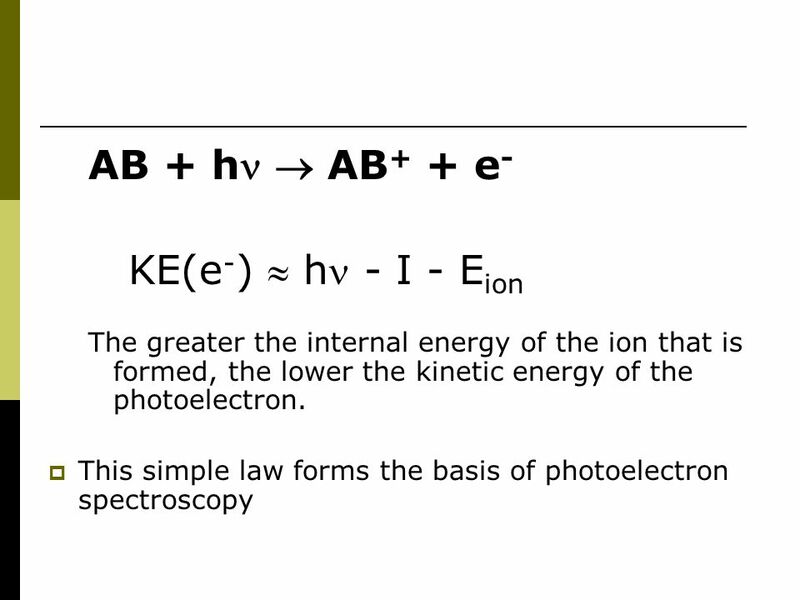  ABCD + h  AB + CD  Importance Atmospheric and astrophysical environment Primary step in photochemical. 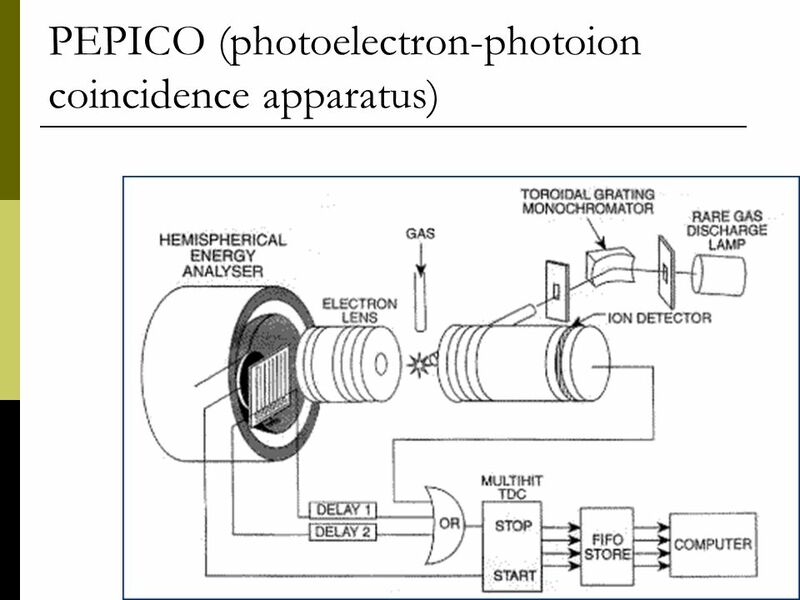 Gamma-Ray Spectra _ + The photomultiplier records the (UV) light emitted during electronic recombination in the scintillator. 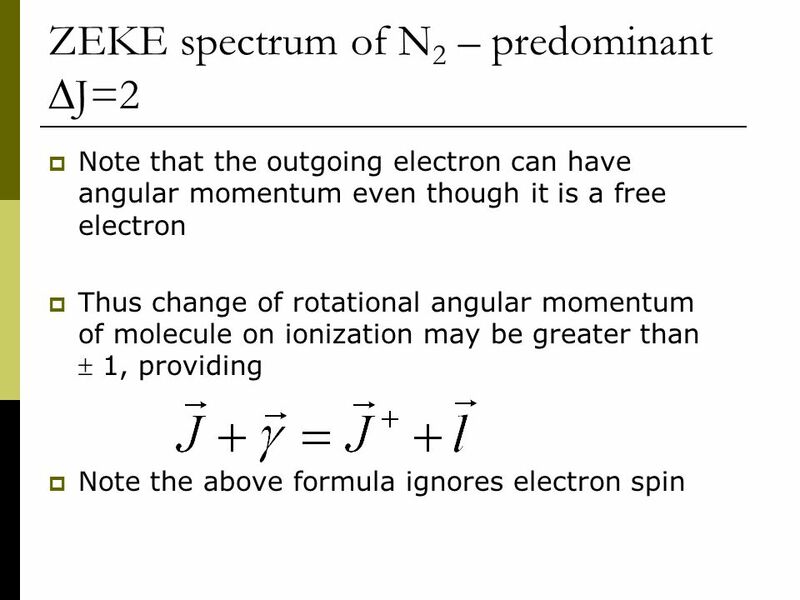 Therefore, the spectrum collected. 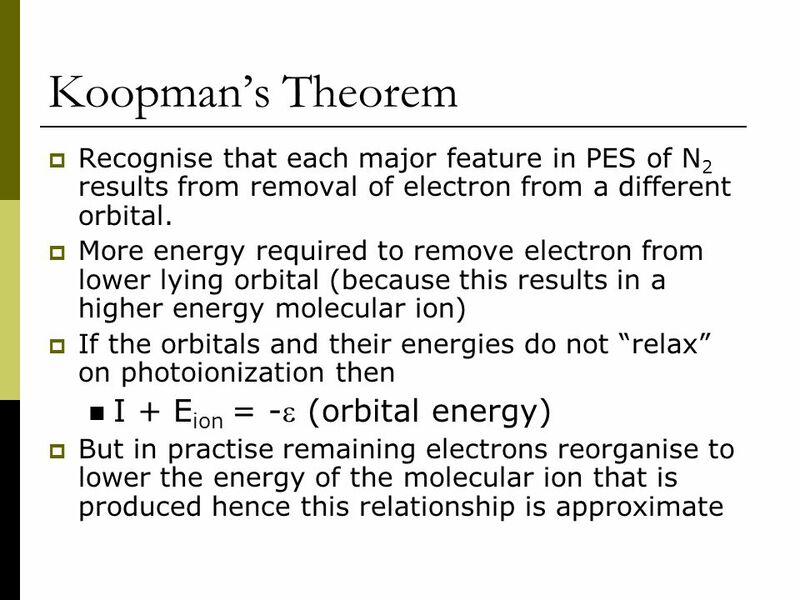 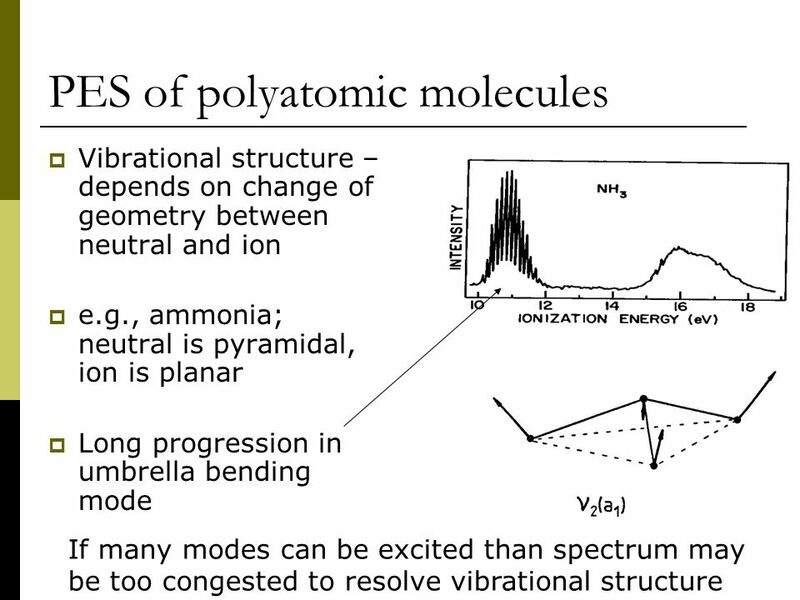 The Shell Model And Photoelectron Spectroscopy and the Structure of Atoms Ch 7 part 1.5. 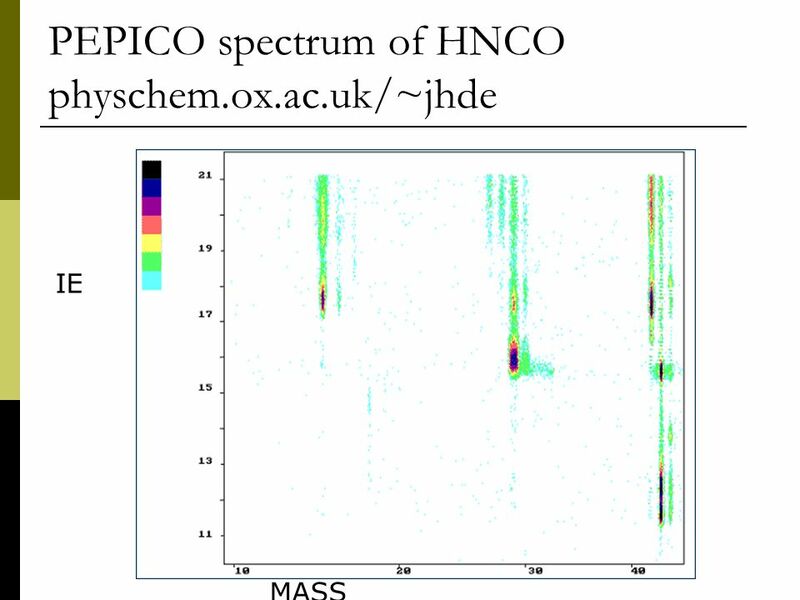 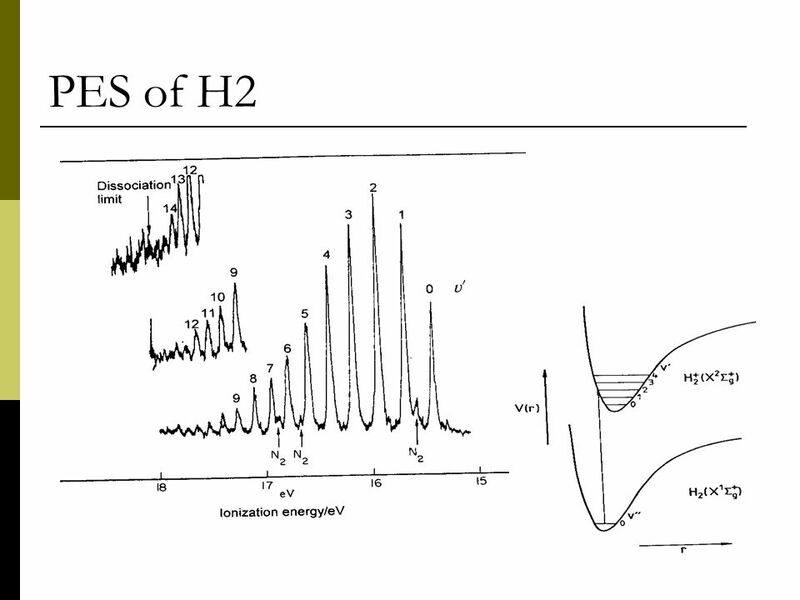 Applications of photoelectron velocity map imaging at high resolution or Photoionization dynamics of NH 3 (B 1 E  ) Katharine L. Reid (Paul Hockett, Mick. 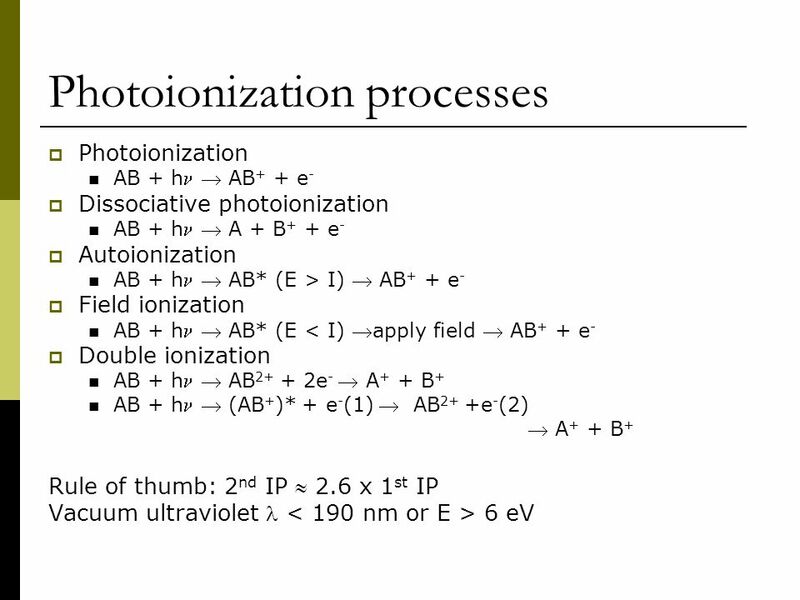 Lecture 6 nitrogen and ozone photochemistry Regions of Light Absorption of Solar Radiation. 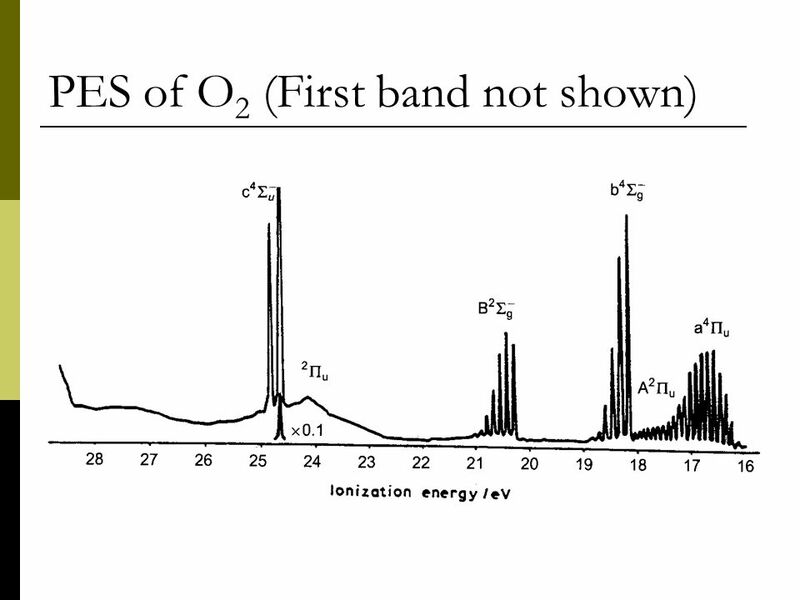 Frequency and Time Domain Studies of Toluene Adrian M. Gardner, Alistair M. Green, Julia A. Davies, Katharine L. Reid and Timothy G. Wright. 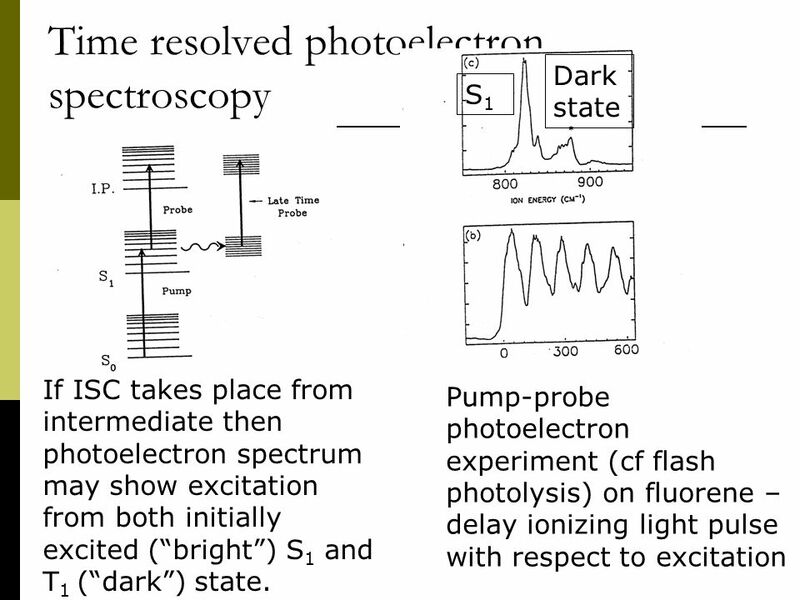 Lecture 36 Electronic spectroscopy (c) So Hirata, Department of Chemistry, University of Illinois at Urbana-Champaign. 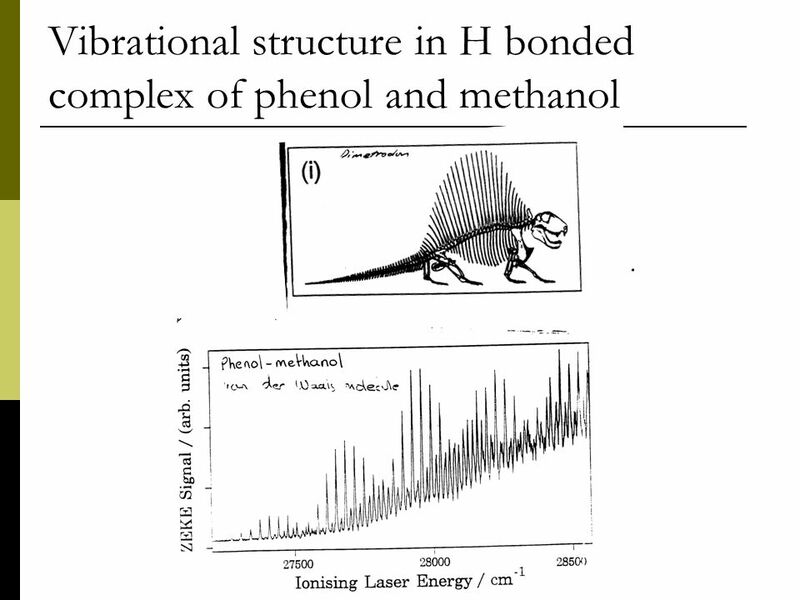 This material has been developed. 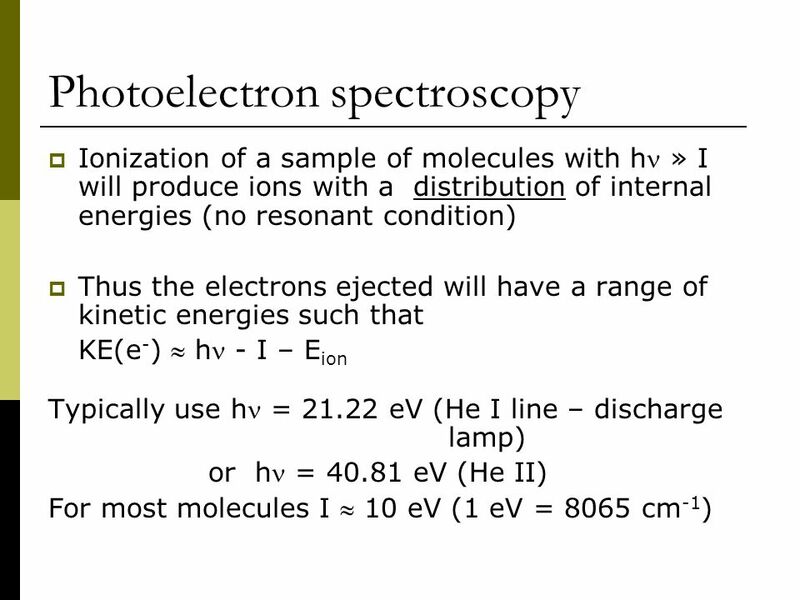 Spectroscopy The Light Spectrum. 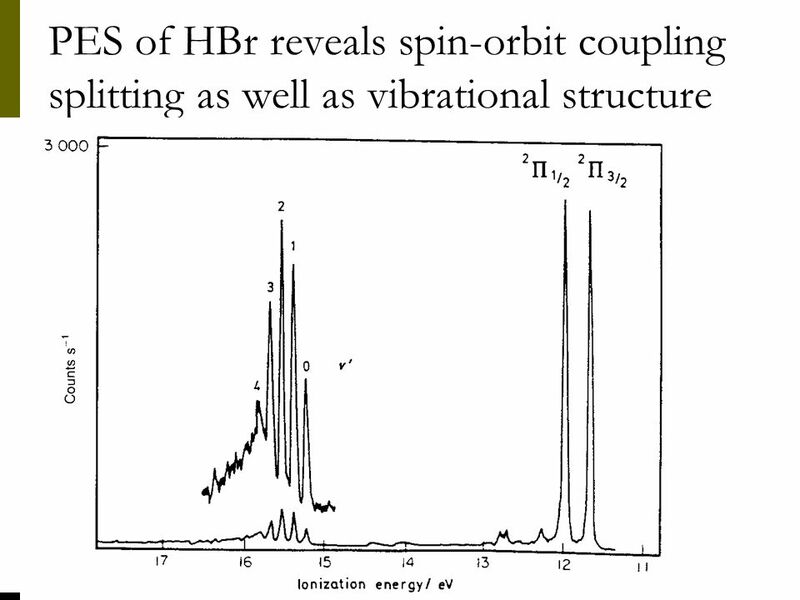 Vibrational Spectroscopy D(t) r(t) Band structure The higher the BO: i) the deeper the Well, ii) the wider the spacing. 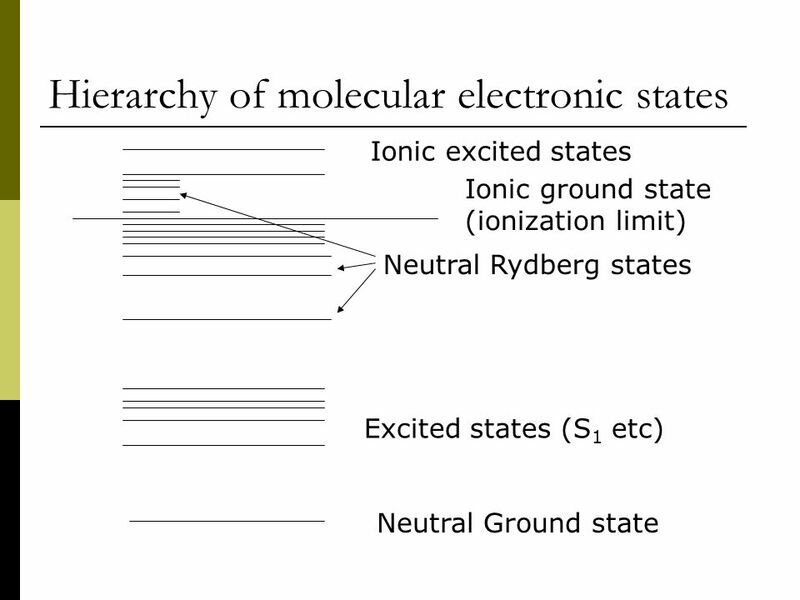 Physical Chemistry 2 nd Edition Thomas Engel, Philip Reid Chapter 25 Electronic Spectroscopy. 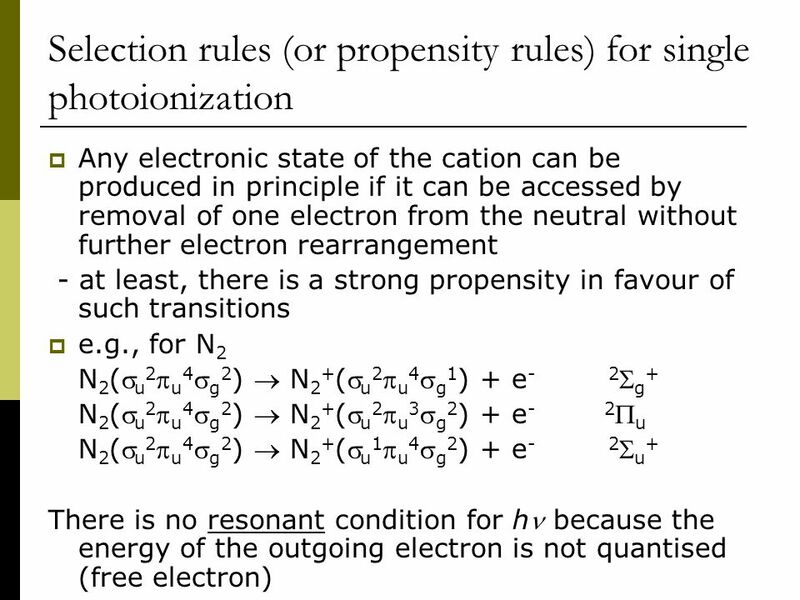 Photoelectron Spectroscopy Lecture 3: vibrational/rotational structure –Vibrational selection rules –Franck-Condon Effect –Information on bonding –Ionization. 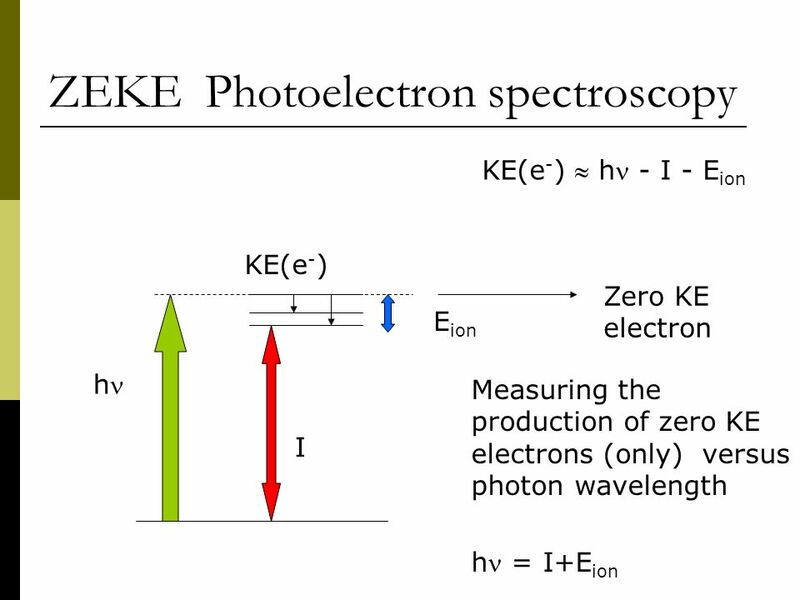 METO 621 LESSON 7. 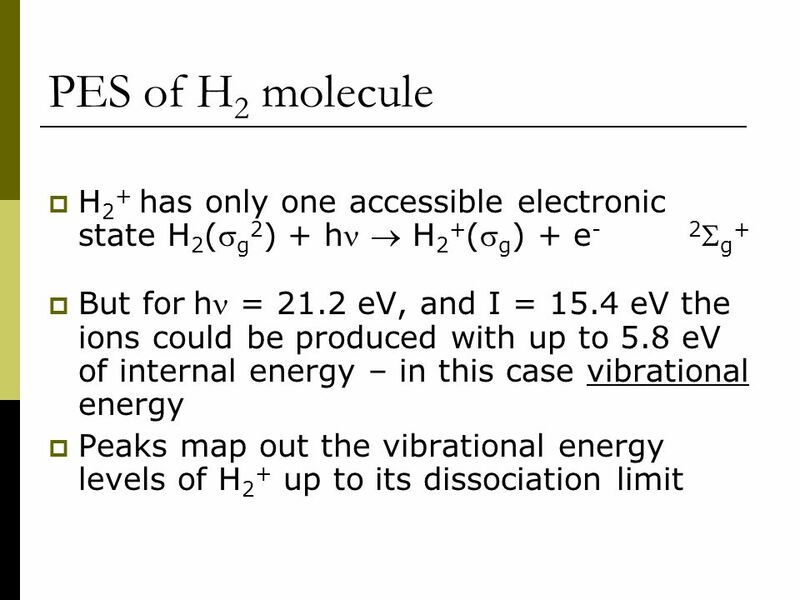 Vibrating Rotator If there were no interaction between the rotation and vibration, then the total energy of a quantum state would be. 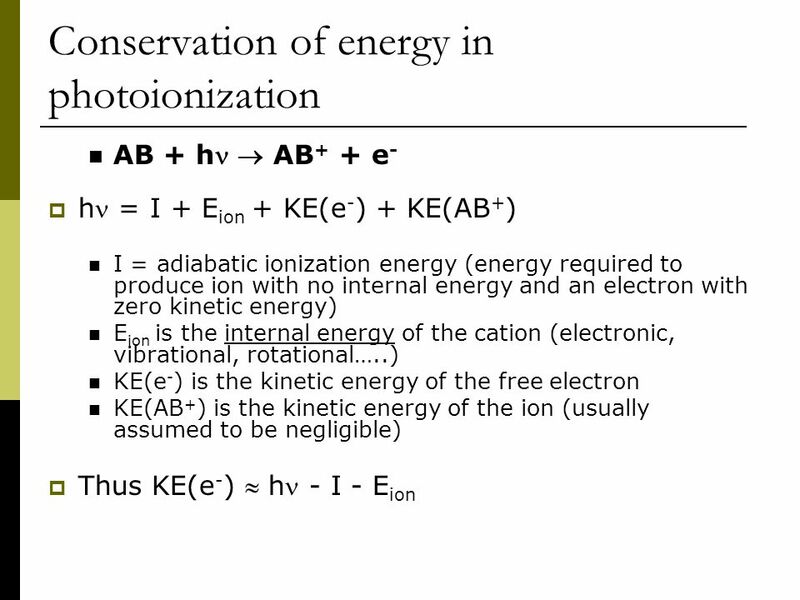 2 AB AB + + e AB* AB +* + e n h or n 1 h 1 + n 2 h 2 + : -absorption 1h  n h  -ionization Energy. 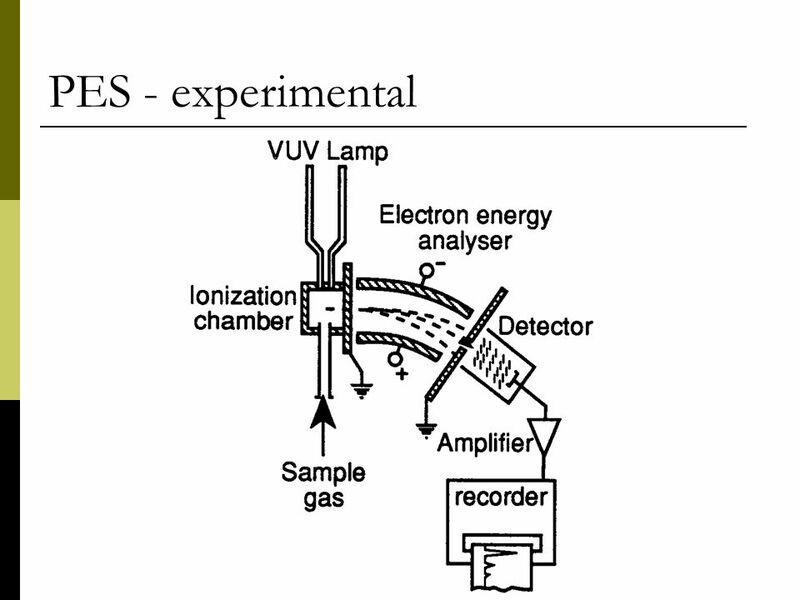 X-ray Free-Electron Lasers: Challenges for Theory, Cambridge, Massachusetts, USA, June 19, 2006 Infrared X-ray pump-probe spectroscopy Hans Ågren Department. 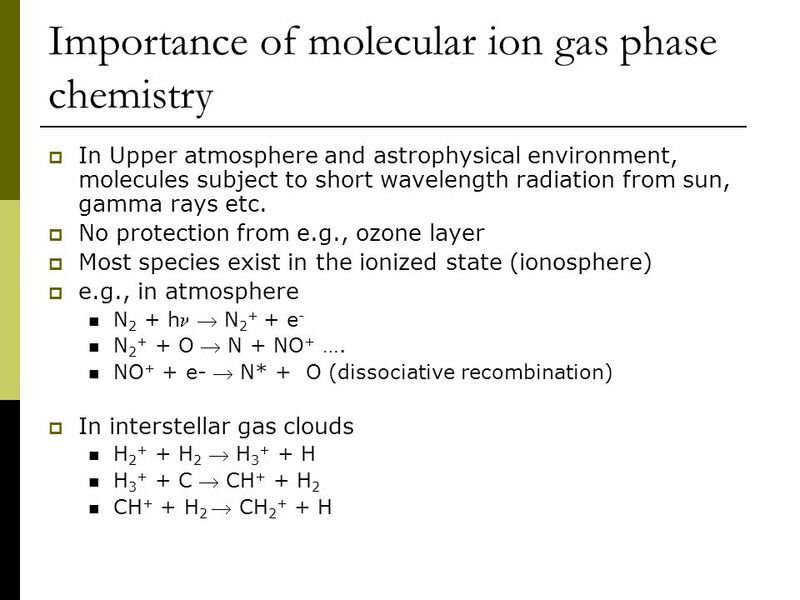 6061 Geoscience Systems (http://vortex.ihrc.fiu.edu/GSS6061/GSS6061.htm) Atmospheric Radiation Energy Budget How the atmosphere system is driven? 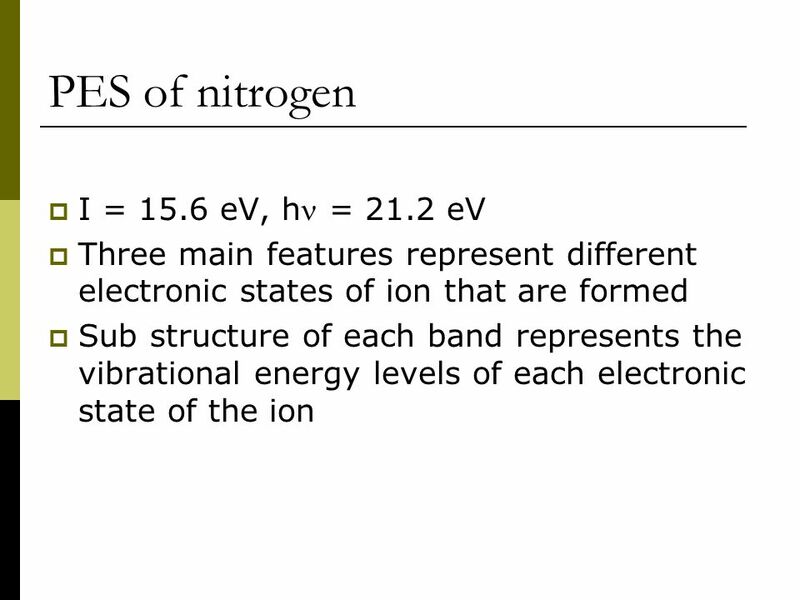 Lecture.